This collection-based exhibition comprises over 60 paintings, sculptures, photographs, and works on paper that explore the universal themes of labor and leisure in America from the 18th century to the present day. The works on view range chronologically from Benjamin West’s exposure of political corruption in the painting Oliver Cromwell Dissolving the Long Parliament (1782) to the photograph The Stone Breakers (After Gustave Courbet), 2013 by Vik Muniz. This recent acquisition by a leading contemporary artist who lives and works in Brooklyn and Rio de Janeiro is a recreation of the French 19th-century Realist Gustave Courbet’s radical celebration of the common laborer at work. A photograph of a collage using images torn from magazines, The Stone Breakers (After Gustave Courbet) is complemented by scenes of industrial and urban labor in the 20th century by Thomas Hart Benton, Stuyvesant Van Veen, and others. Their rural counterparts are seen in the wood engravings of Winslow Homer from the 1870s, as well as the prints of Clare Leighton in the 1930s, the cotton pickers of William Gropper in 1952, and others. In her three prints entitled Executive Tower, West Plaza, 1982, Ida Applebroog features self-absorbed business people, as she explored issues of contemporary urban identity in terms of isolation, alienation, and dehumanization. A section of the exhibition focuses upon artists at work, with early 20th-century photographs by Edward Curtis and Carl Moon of Native American basket and pottery makers. A painting by George Inness, Jr. features his father, George Inness, painting outside his Montclair studio (c. 1889), whereas an untitled painting by Jasper Johns features personal elements of the artist’s studio in 1983, with an embedded image of Johns’s lithograph of his well-known sculpture of brushes in a Savarin coffee can—tools of the artist’s trade. Images of leisure in the exhibition encompass children at play, with Eastman Johnson’s Sketch for “In the Hayloft,” c. 1877–78, Homer’s See Saw, Gloucester, Massachusetts, 1874, and Currier and Ives’ American Homestead-Spring (1869), and Montclair art colony artist Lawrence Earle’s version of the popular string game Cat in the Cradle (1891). The theme of sports is represented by various works, including images of horse racing at Saratoga by Winslow Homer, as well as Jon Corbino’s Race Track (1936) and golf in 1932 by Orrin White, based in Pasadena, California. 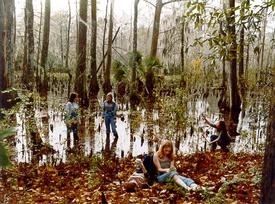 The beach and bodies of water as the locus for leisure activities is featured in the 19th-century work of Winslow Homer, as well as the early 20th-century artists Jane Peterson and Hayley Lever, with Justine Kurland providing a contemporary perspective in her photograph Frog Swamp (Covington, Louisiana), 2001. Another section of the exhibition is devoted to images of music and dance, ranging from late 19th-century works by Arthur B. Davies and Charles E. Proctor to the era of the 1940s as seen in Hilde Kayn’s Swingtime (1945) and Weegee’s photograph Calypso (At a Club in Harlem) (ca. 1944). Irving Couse’s early 20th-century painting Indian Courtship featuring a flute-playing Native American also relates to the themes of friendship and romance, as evidenced in other works in the exhibition, including Navajo painter Harrison Begay’s (1917–2012) Old Friends Meeting (n.d.), John Ahearn’s monumental sculpture of a man from the Bronx and his dog, Toby and Raymond (1986), as well as Andy Warhol’s small 1972 photo album of his friends and associates, some of whom starred in his movies. Photographs of urban life and leisure range from John Sloan’s Bonfire Snow (ca. 1919) to works by Garry Winogrand and Joel Meyerowitz in the 1960s, to Faith Ringgold’s monumental quilt Tar Beach 2 (1990) and Dawoud Bey’s beer-drinking Smokey, 2001. Their more suburban, domestic counterparts can be found in the works of Will Barnet (Old Man’s Afternoon, 1947), Roger Brown’s print of television-watching people, Talk Show Addicts (1993), Gregory Crewdson’s Untitled (Pregnant Woman/Pool) (1999), and Rachel Perry Welty’s Lost in My Life (Wrapped Books) (2001). At times some of these works provide subtle intersections of labor and leisure where one person’s job is another’s entertainment. 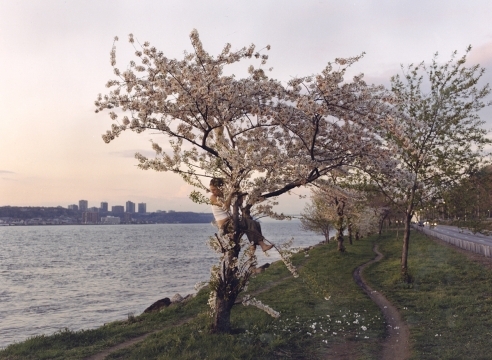 All of the works highlight the rich diversity of American life and culture. The exhibition is on view from September 12, 2015 through Fall 2015 in Lehman Court, through 2016 in McMullen gallery, and through Summer 2016 in Roberts Gallery.